So it’s been a long time since this blog has been updated, but now the volunteers (like me!) have our own log-in so hopefully (fingers crossed) we will put some up with a bit more regularity from now on. 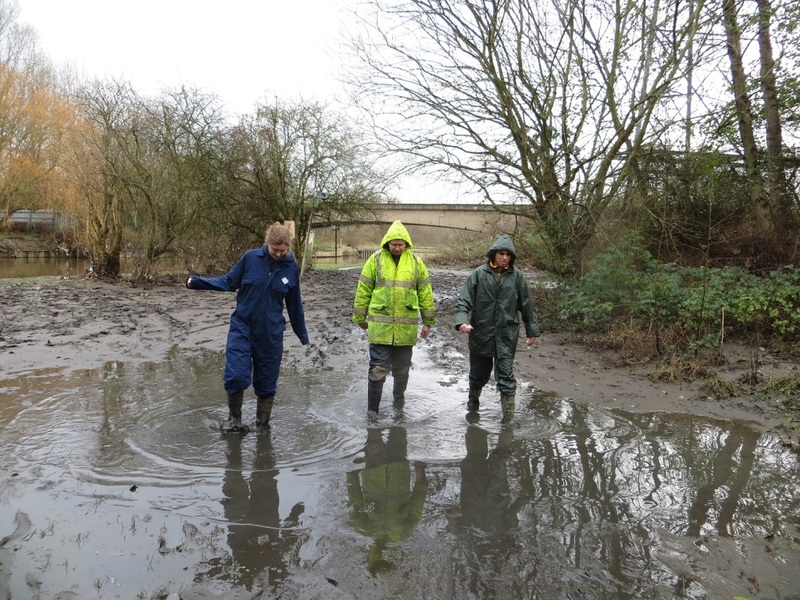 This post is to give people an update on how the recent flood has affected Skelton Grange and the surrounding area, and what we’re trying to do about it. Some of the areas surrounding Skelton Grange a few days after the main flood event. It has been over 2 weeks now since floods hit large parts of the UK on Boxing Day (26th December).Bits of Leeds have been badly affected, but at Skelton Grange we got off fairly lightly. The river took a bite out of our well eroded riverbank and deposited a fair amount of debris, but the waters never made it over the fence. Look out for a blog post about the riverbank erosion in the near future. Skelton Grange’s bank. You can see the erosion and some of the litter that has been dumped by the flood. The areas surrounding us weren’t so lucky; the riverside path which makes up part of the TransPennine Trail has been trashed and our neighbours at Thwaite Mills were badly affected. Being a watermill, Thwaite Mills is right by the river and so caught the full brunt of the rising water. 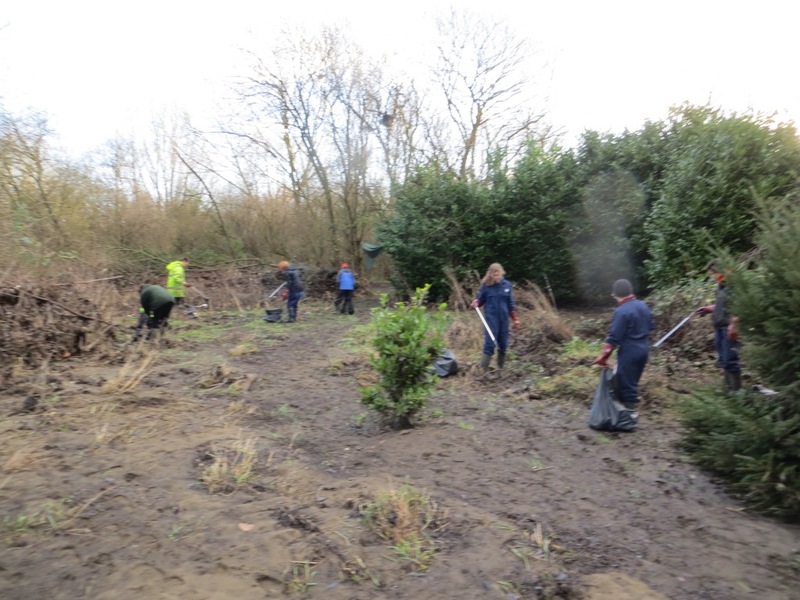 The clear-up of their site is going to take quite a while, even with the great team of staff and volunteers they have, so on Friday we made a change to our normal Green Team session. 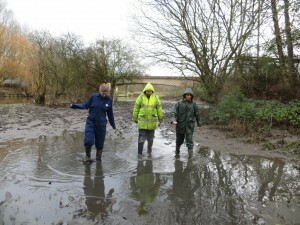 We donned overalls, stuck on some wellies and made our way over the river to lend a hand. Even getting there was a challenge, but thankfully nobody fell in the mud. The watermill building and many of the surrounding outhouses were flooded (The day before we arrived a team had removed most of a tree from the waterwheel itself) but the equipment in there requires specialist knowledge that the team at Thwaite Mills are far more equipped with than us, so we went to work on the outside area. Thwaite Mills is situated on an island between the river and the navigation (canal) and has several acres of grounds, woodland and wildlife areas; most of which were engulfed by flood water. 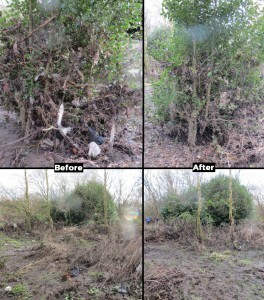 This has left a trail of debris covering the site, and quite a herculean task for our Green Team volunteers to tackle. The debris that the waters bring with them is often overlooked when people talk about flooding. The helicopter pictures of flooded areas look amazing, even quite beautiful, but that is extremely deceiving. To be frank, flood water is disgusting! All kinds of things get picked up and moved around by floods, some of it is interesting, but 99% of it is gross. As well as river silt and sand there’s raw sewage, sanitary products, plastic, foam, insulation, clothes, tires, barrels, metal, food… you get the picture. 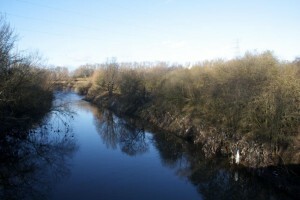 All those things and more have been deposited by rivers all over the UK in these floods, and Thwaite Mills is no exception. 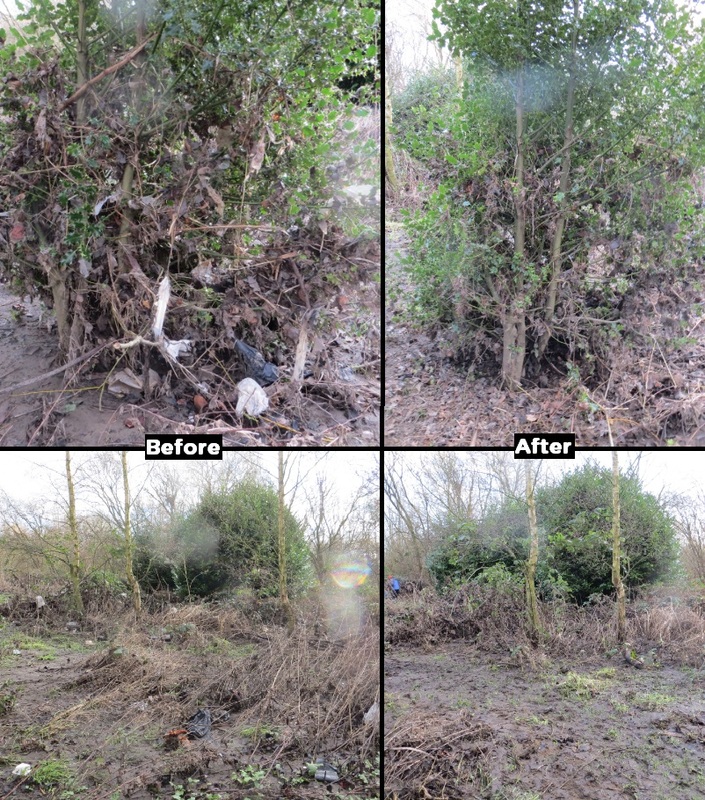 The wildlife garden that they’ve been creating for the last 8 years (since the last major flood there) has been largely spoilt by a layer of sand, silt and rubbish. Cue us and our fetching blue overalls. PPE (personal protective equipment) is important when dealing with flood debris. We were fully kitted up with double layered gloves, overalls and wellies. 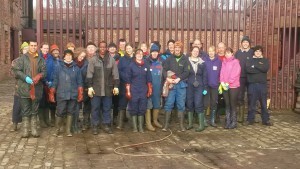 All our gear was thoroughly cleaned both at Thwaite Mills and when we got back to Skelton Grange. I cannot emphasise this enough; flood water debris is gross! 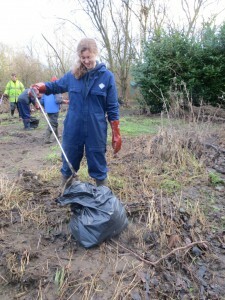 We spent all Friday with bin-bags, litter-pickers and wheelbarrows attempting to clear up some of the grounds. 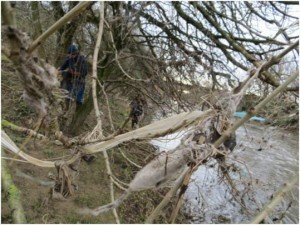 The flood waters left rubbish in trees and bushes as well as on the ground. Strips of plastic and sanitary products were wrapped around vegetation and required disentangling. Some of the rubbish was quite big or deceptively heavy. It was not an easy task and there is still much work to do, but I think we made a significant difference. Hopefully it won’t be long until the site is back looking as beautiful as it normally does. 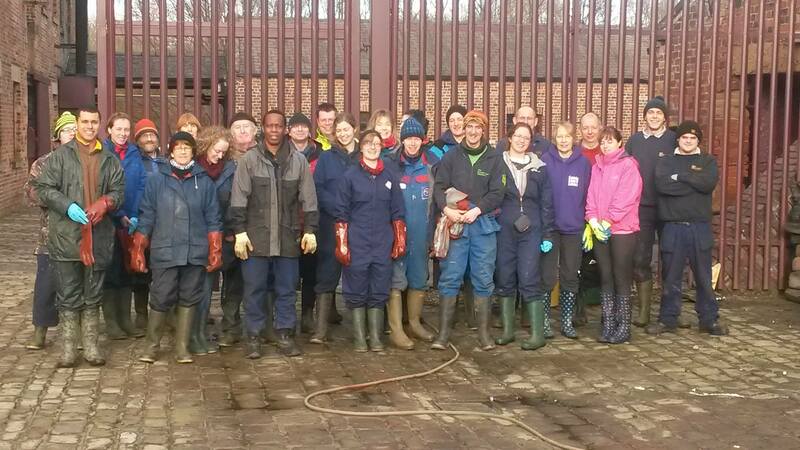 Thank you very much to Thwaite Mills and the Leeds Museum team for having us and for the chocolate cookies! Good Luck with the rest of the clean-up. River Island purse (very apt as we were on an island in a river). Next job is litter picking on our own riverbank… As you can see it needs it. 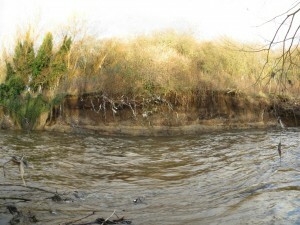 Our bank a few days after the main flood. The river is still very high.